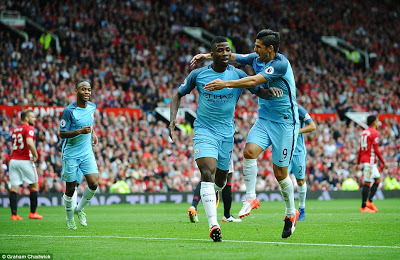 Super Eagles midfielder, Kelechi Iheanacho has admitted that he feel delighted to have scored the winning goal in Manchester City’s 2-1win over Manchester United in Saturday’s Manchester derby. Iheanacho who was a revelation for the Citizens last season where he scored 11 goals in the Premier League, wasted no time to open his goal account as he scored the vital goal that sealed maximum point for the visiting team. The youngster revealed that it’s a dream come true to have scored the winning goal in a Manchester derby. “My goal against Manchester United means alot to me because it is a dream come true to have scored in a Manchester derby and for my team to have won at Old Trafford. I am very happy for my team because they really worked hard to get the victory today. I am also happy for the fans who have come to support us today,” Iheanacho said during the post match reaction.